The ‘tête de femme’ was a popular motif in France around 1900. These ladies – combined with flowers – often symbolised themes, such as Sleep, Dream, or Desire. 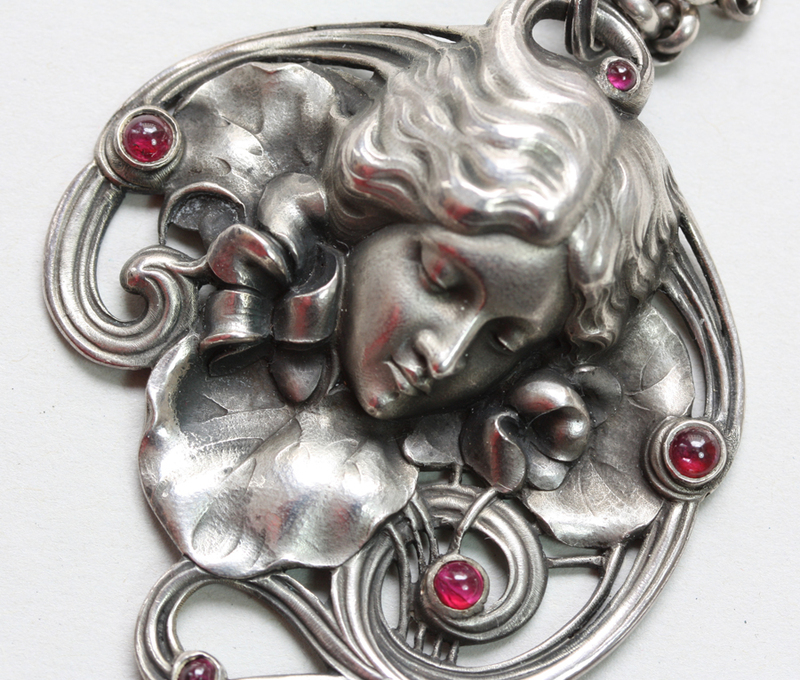 This dreamy example is one of the prettiest Art Nouveau girls’ heads. 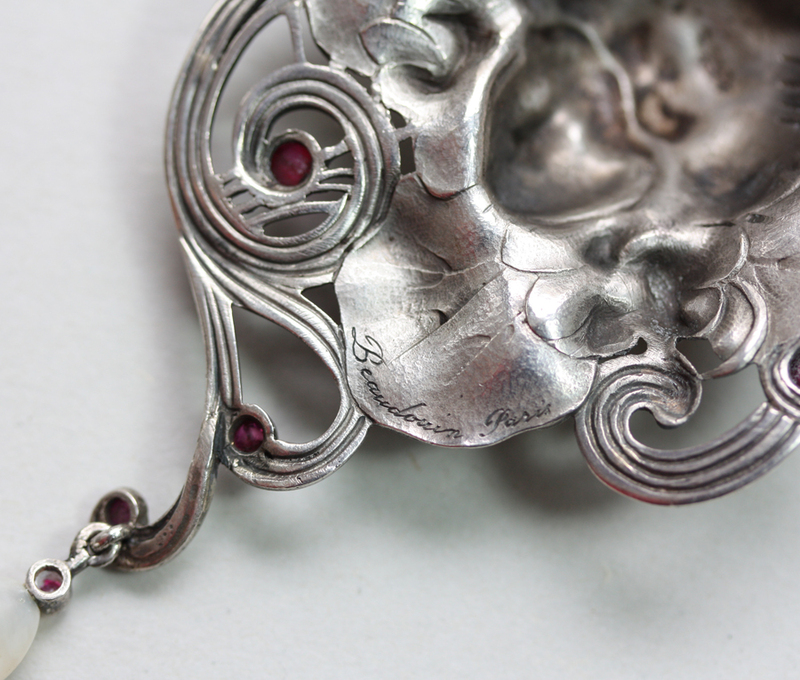 The large silver and ruby pendant is called Modesty and is signed: Beaudouin, Paris (Antoine Beaudouin). The lady in this pendant has downcast eyes and is surrounded by violets (Viola Odorata); the stylized hair framing her face also determines the contours of the pendant. Violets stand for modesty as well as romantic love. Other versions of the same design are known. For instance, a lovely gold brooch with an enamelled face and diamonds instead of cabochon cut rubies is in the Schmuckmuseum in Pforzheim (inv. no. KV 1404). It bears the maker’s marks of both Antoine Beaudouin (AB around a shield) and Georges Le Saché (LS around a thread). Le Saché was one of the most famous goldsmiths active around 1900, and also worked for Lucien Falize. That the gold Phorzheim Modesty bears more than one maker’s mark is exceptional and suggests that Le Saché did not execute this brooch alone. Beaudouin not only must have designed Modesty, but also have had a hand in its execution. 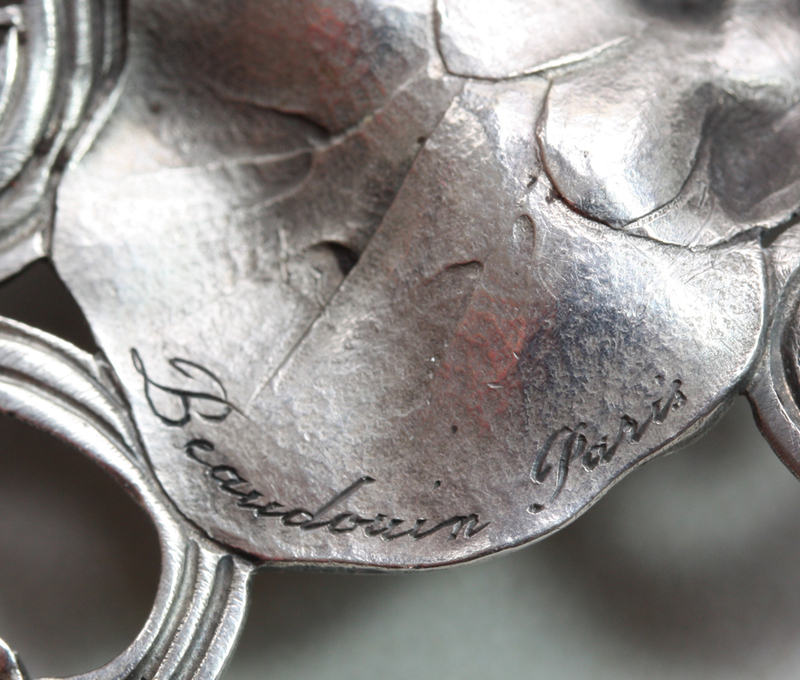 The silver Modesty pendant is one of Beaudouin’s few fully signed jewels. It has no maker’s mark, so we do not know whether Beaudouin crafted it, or if Le Saché made it for him. Literature: Martijn Akkerman, ‘De “Modestie” broche, een belangrijk juweel van de Parijse Art Nouveau goudsmid-juwelier Antoine Beaudouin’, in: Antiek, 4, November 1986, pp. 210-215.